After a very long wait, the PGI-550 and CLI-551 REdSETTER, chip resetter is now finally available and will shortly be made available with an updated refill bundle for 550/551 cartridge users. There are no limits to the number of chip resets. The REdSETTER does not limit the number of resets it will perform making it ideal for cartridge refill operations. The cartridge slots in horizontally rather than at an angle. As a result. any ink leakage caused by cartridge handling is less likely to ingress into the units electronics. 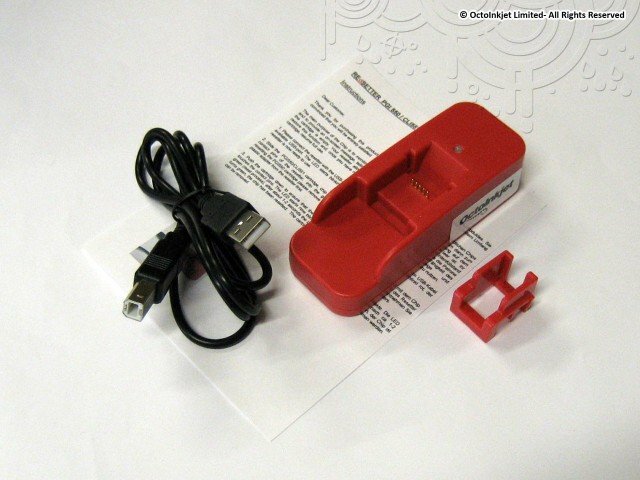 The REdSETTERs also come with a removeable guide which allows you to slide CLI-551 cartridges into place or just remove it to reset the larger PGI-550 cartridge instead. Power is provided via a standard A/B type USB cable (provided). Compatible USB powered chip resetters are also available for North American model 250/251 chips/cartridges.